I’m an enthusiastic promoter of digitization across carriers, forwarders, and shippers. And, in the last year or so, it has been gratifying to, at last, see many players rolling out digital platforms. But has the digital age of freight arrived? Not quite. Despite the rollouts, the reality check is that they are not taking off in the market at a breakneck pace, to put it mildly. I’d venture that 99.9% of freight services are still being sourced and booked offline. This is what we’re hearing, and the data backs this up. Web traffic data from SimilarWeb, shows under 5,000 unique US website visitors a month to the three top forwarders’ digital platforms. Attracting 5,000 visitors is, shall we say, modest. Digital transformation is hard. Maersk contended with this by setting up their digital freight forwarder as an autonomous team with its own brand, Twill Logistics. CMA CGM is experimenting with new collaborations to see through on their digital vision. Forwarders have taken to hiring digital transformation executives, while waiting for new platforms, like K+N’s digital booking to take off. Granted, uptake is slow, but eventually, these technologies will catch on. Here are some ways they can make it happen faster. It’s not that logistics customers don’t want the functionality that’s being offered – shipment management, booking, and tracking. So I asked our Head of UX and Design here at Freightos, Guy Laor, why he thinks the new platforms aren’t getting picked up faster. You need to connect to the user’s behavior. Thinking about offerings from a feature orientation means you’ve wandered down the wrong path. Platforms need to align with the way users actually work. Changing the user experience might sound like a big ask, but the good news, according to Guy, is that you don’t have to think in terms of a major revamp. Identify the focal point and ignore everything else. Most tools that succeed started by solving a small part of a workflow, really, really well. From the outside, it might seem small, but it’s not if it makes users’ lives better. So, if your platform isn’t retaining customers, how do you identify that small part? Join users for a day in their life. Watch how they operate and where you can make a change to make their lives vastly better. See where they come up with duct-tape solutions and then help them do that way, way better. Then, continue to involve them in the change, whether that’s through mockups, feedback or tracking usage. It can be a challenge marketing to a new audience. Only one of the forwarder platforms we assessed used paid advertising as a core growth channel … and for good reason. PPC will drive a trickle of small shippers. Google Adwords reports only 2,400 direct searches/month for FCL. The vast majority of these searches are informational queries. The rest need handholding. Most forwarders won’t be interested in using channels that mostly bring micro-importers who have little prospect of bringing significant recurring revenue. So if not paid search advertising, then what? For two platforms, leveraging content (articles, magazines, etc) to get word-of-mouth growth is their top acquisition strategy. That also matches most of the tech providers we assessed. There’s a problem, though. With the exception of some specific verticals, most smaller shippers have limited word of mouth growth potential. Basically, it’s hard to market these new platforms. Digital marketing to large shippers can be even more challenging! A top ten forwarder’s CMO told me that their core marketing strategy is … sales support. Each enterprise shipper has their own set of processes. There are no magic out-of-box systems for ERP integrations. Put these two together, and it makes it difficult to set up experiments and trials. In other words, a digital-first strategy for marketing a platform is hard, and helping big shippers still means direct face to face sales. 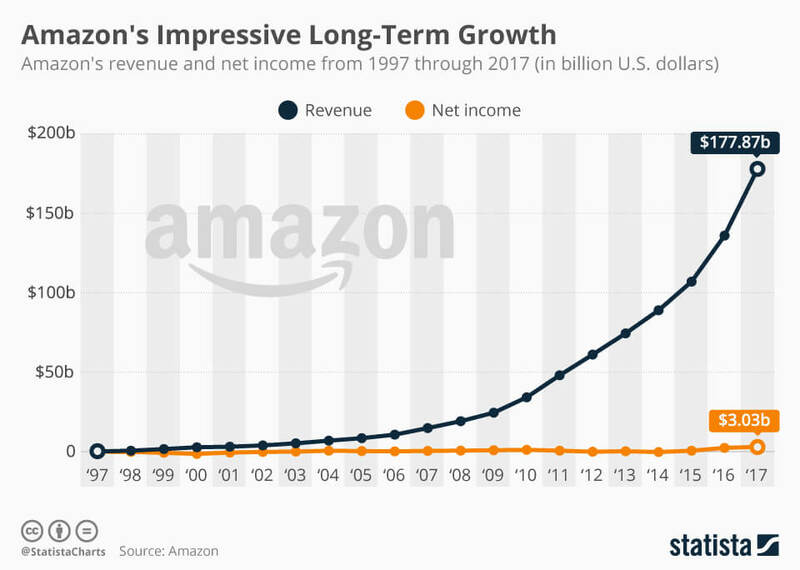 In 1995, Amazon brought in a paltry less than a million dollars of revenue. When it came in at $16 million that next year, still a paltry figure, it must have been a cause for celebration. Platforms, particularly in traditional industries, do not take hold overnight. Even the runaway successes at Airbnb and Uber didn’t happen overnight. Success took years of iterations and elbow grease. As an industry, we shouldn’t expect these platforms to dominate overnight. The time it takes for a startup to become a unicorn (worth a billion dollars), on average is 6 years. Hype is an integral part of new technology but we shouldn’t get too carried away by the hype. Like any transformation, growth takes time. AllCargo hired an ex-Paypal employee to lead their digital transformation efforts. Damco spun off Twill Logistics, which has Damco board input, but it operates independently. CMA CGM formed an investment fund and created a startup accelerator program. DB Schenker invested heavily in uShip. Only 1% of countries operated container ports in 1963, but by 1983, it finally hit 90%. It took container shipping twenty years to replace what had gone before. One only needs to look at the impact of the Maersk hack in 2017 to see how dependent we are on technologies working. It’s hard for large companies to push the envelope, one reason why airlines still use old-school IBM terminals for passenger travel management. While technology may have become easier to roll out, there are still significant challenges in educating customers, iterating products, and system integration.significant challenge. But as an industry we can’t (and shouldn’t) give up. It’s going to get easier. Finally, freight companies objectives and customer expectations are converging. Customers very much want an online experience. Providers want a low-cost digital sales channel and leaner more automated back offices. With the right mix of research, persistence, awareness, and organizational planning, in 2025, freight will be digitally sourced, tracked and booked. And both providers and customers will have benefitted. Logistics provider? Now's the time to double-down, not fold. And we can help.